What’s preventing you from trying something new? Do you ever think about the movement in your body that physically prevents you from doing new things? Like, what is that invisible switch that I swear exists in everyone’s throat which prevents men and women, young and old people from saying that which they want to say but are afraid to evoke? What kind of magic do you have to conjure to turn that switch off and stand up for yourself or for something you want or to take a risk?? Well I’m really just trying to get you riled up for my first attempt at Indian food. Let me tie these two things together. I’m half Indian – what that means is that for more than two years in elementary school I had a cop out costume of wearing either a sheet as a sari or one of the Indian dresses my dad or relative brought back from India along with a Magic-markered henna tattoo on my hand and a bindi. What it means is that I grew up wishing my mom would make Uncle Ben’s rice when I tasted this new buttery sensation at school one day after only eating basmati rice with every dish (yes, gumbo, chili, you name it, it was basmati). What it means is that my racial ambiguity let me get away with telling my kindergarten teacher that I spoke Spanish (at least until parent-teacher conference). What it means is that I grew up learning to taste spicy, rich, curry-ful foods and had a pickle on the table most nights at dinner. And NOW, what it means is that I was so spoiled growing up eating Indian prepared by mostly my dad or grandma, that I am so scared of ruining those memories by messing it up. So maybe this isn’t a huge thing for me to try new, but at its core what it means is I’m treading new territory. One of the worst things about starting something new is how daunting it is to think that it might take you a while to master it, right? 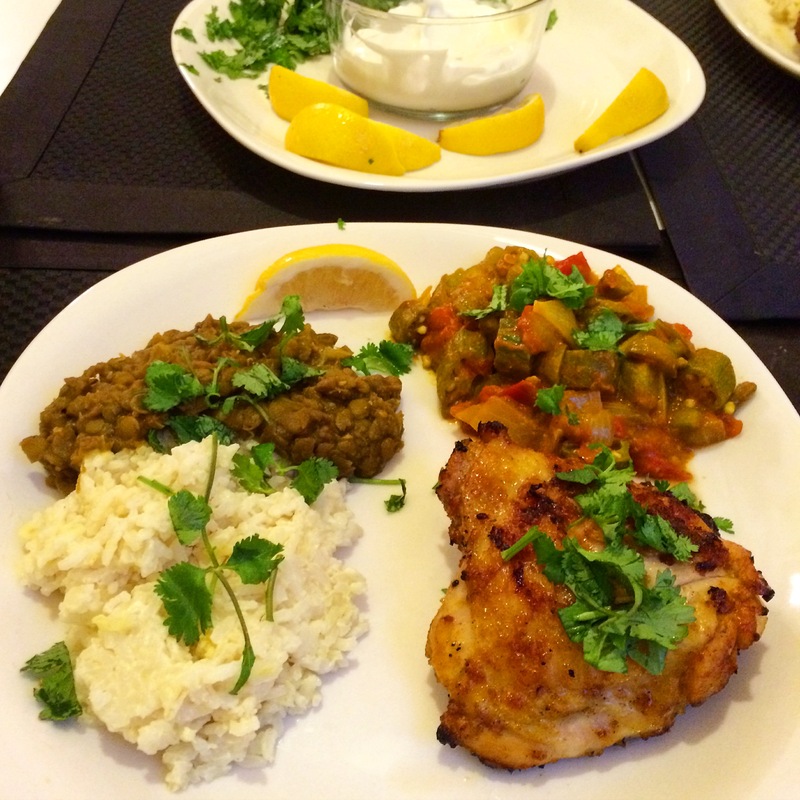 I’m here to tell you that these three recipes are good places for you to start with basic Indian recipes. The biggest step is making sure you can get the right spices and not being worried that your entire kitchen is going to smell like curry for a day or so. 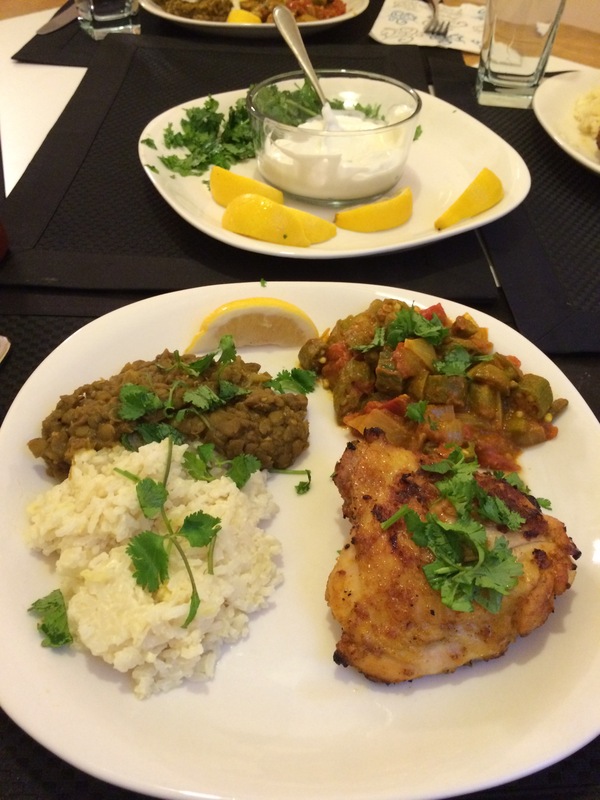 My dear friend Kate is the one who encouraged us to make this meal as she LOVES Indian food and is a great friend to experiment with. Take these recipes on with your family member, someone you go on adventures with, or impress your co-workers with your attempt at a new cuisine. I was blessed to have my sister and two of my close girl friends cook with me for a lovely Sunday night dinner partay. 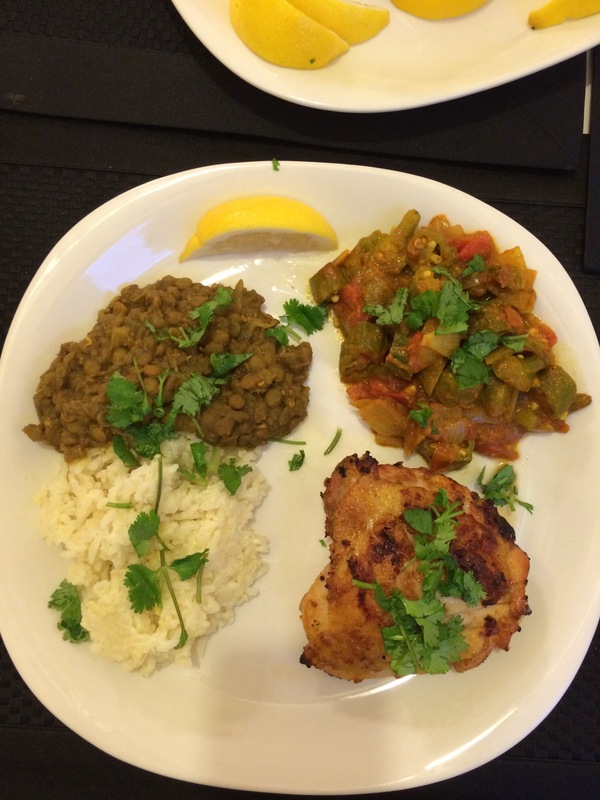 Make sure to start this recipe first, lentils take a while to cook! 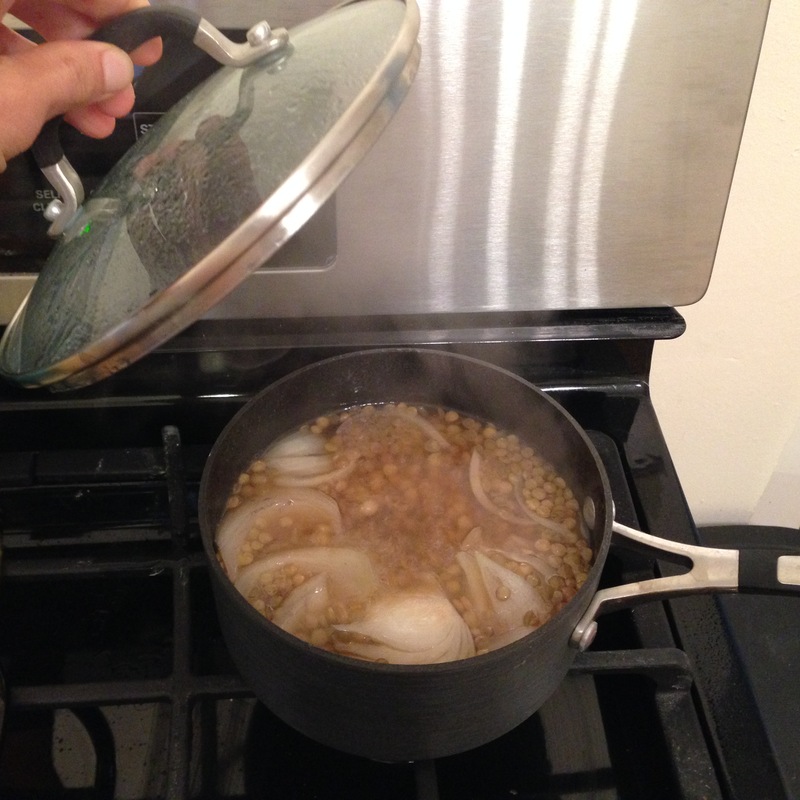 Combine the lentils, onion, garlic, bay leaf, and water in a medium saucepan. Bring to a boil, reduce the heat, cover and simmer 30 minutes. Add salt to taste (under-salt slightly because you will be reducing the liquid), and continue to simmer for another 15 minutes, until the lentils are falling apart tender and fragrant. Remove the onion and garlic and discard. Heat the oil in a large, heavy nonstick skillet over medium-high heat. Add the spices and stir as they sizzle for about 30 seconds, until very fragrant. 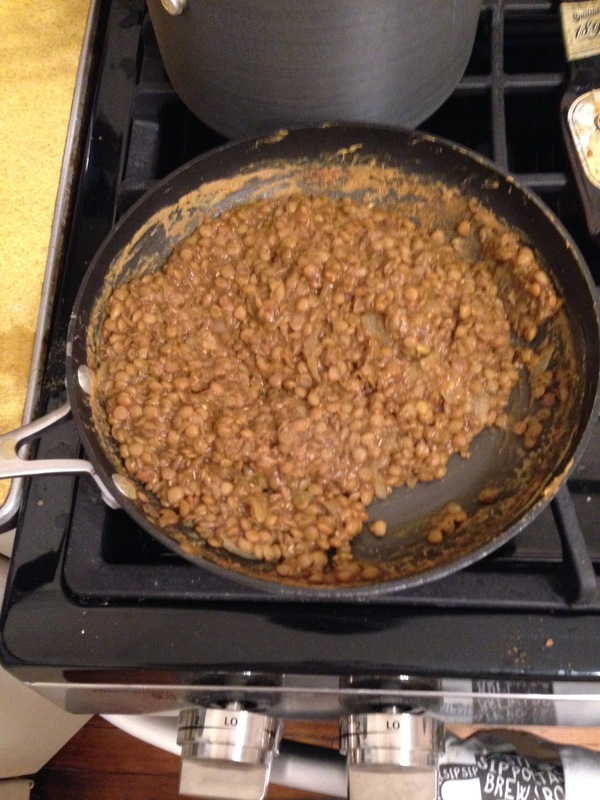 Add the lentil with their liquid and cook, stirring and mashing with the back of a wooden spoon, until the mixture thickens, like refried beans. You may need to add some more water. Add salt to taste, once the mixture has reduced to the desired consistency. A few hours before cooking (at least 1 hour and up to 6), puree all the marinade ingredients (all ingredients except the chicken) in a food processor or blender until smooth. 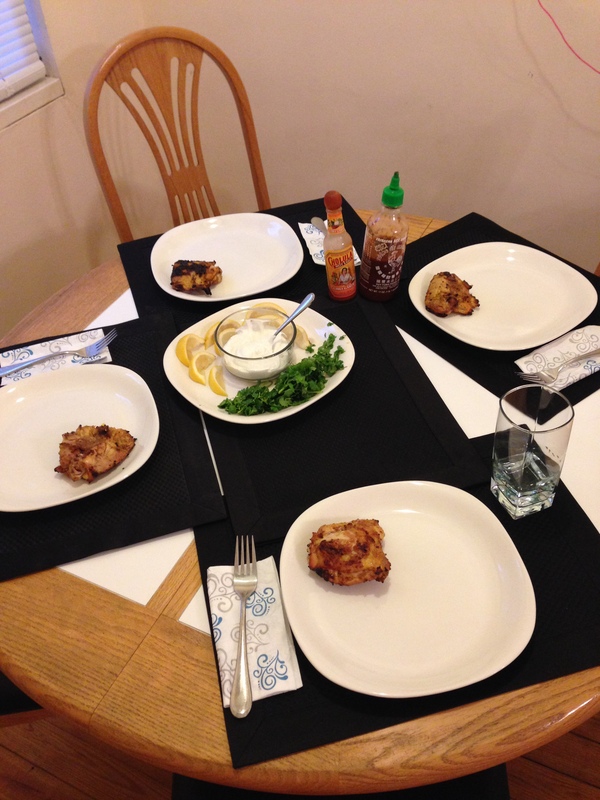 Put your chicken thighs in a large freezer bag or large bowl and pour marinade over. 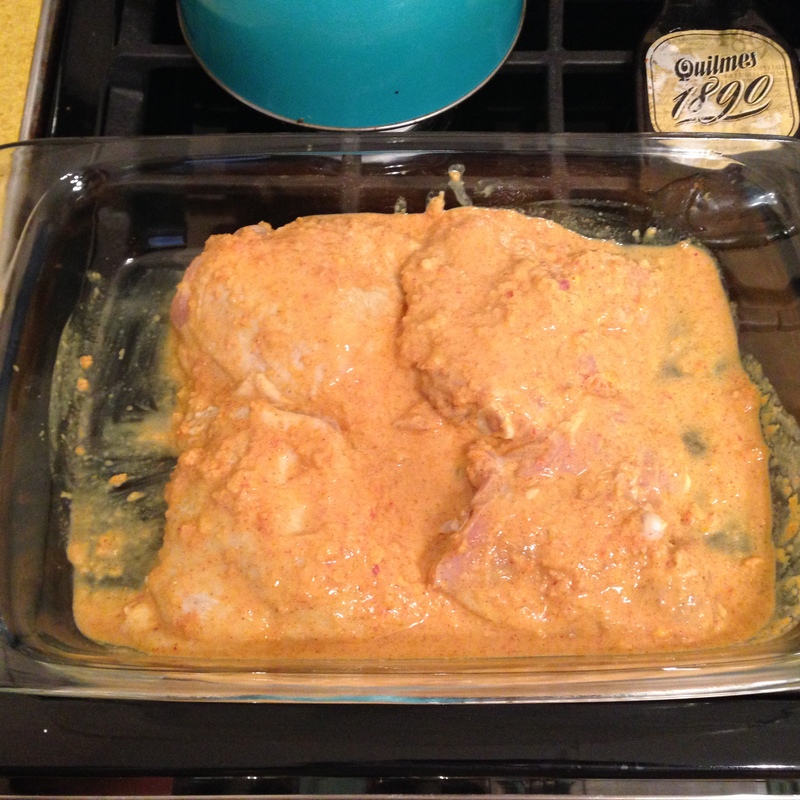 Ensure that the marinade covers all the chicken pieces and place in the fridge to marinate. About an hour before cooking the chicken, take out of the fridge so it comes to room temperature. Preheat the oven to 350. 4. Place chicken with marinade in a large baking dish and bake for around 20 minutes. During this time start to get your okra cooking. At the ten minute mark, light up the grill to med/high heat. You really need to be cooking on your friend’s porch – one which has a beautiful banana pepper plant, an OVERFLOWING mint plant, basil, as well as bell peppers. 5. After 20 minutes in the oven, take the chicken out of the oven and place each piece on the grill, shaking off the marinade. 6. 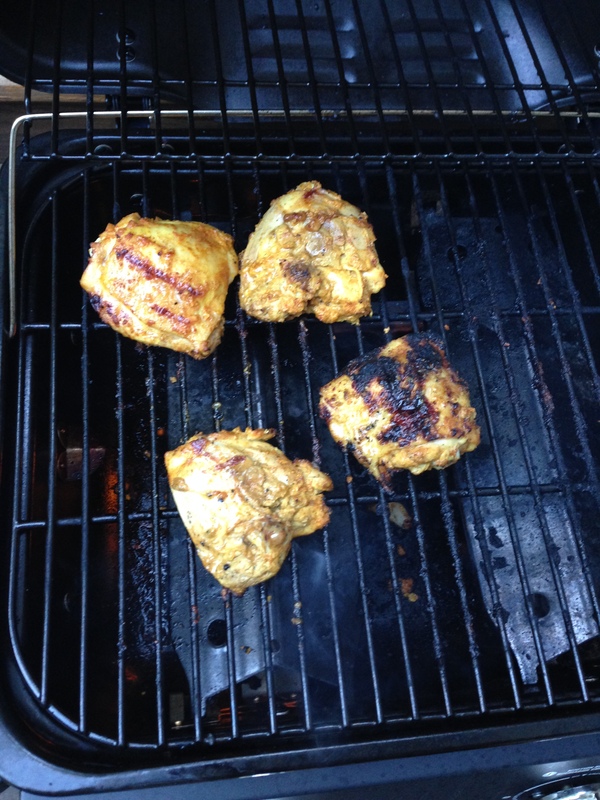 Grill for about 7 minutes on each side, then put chicken on a clean plate and let rest for a few minutes. 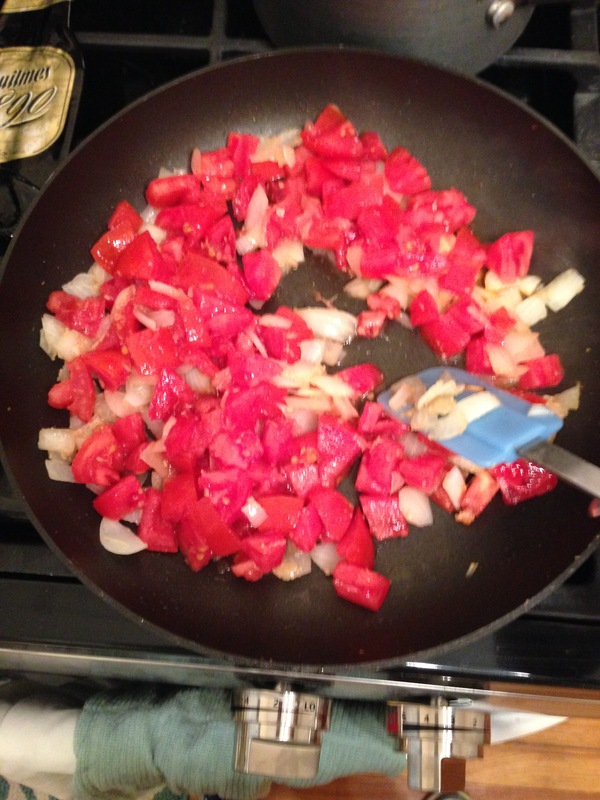 Heat a tablespoon of veg or olive oil in a large skillet until medium-hot. Add the frozen okra and cook for around 4-7 minutes until the okra is green and just cooked (can be a little undercooked you will put it back in the pan later). 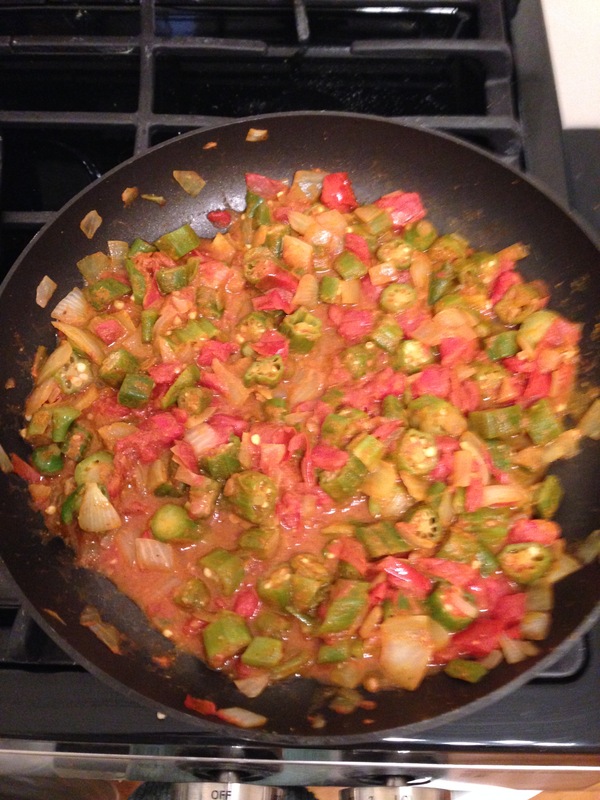 Place okra in a small bowl and add a little more oil to the pan. Add onions on med/high heat until they become soft and translucent. Add your ginger-garlic paste for another minute. Add tomatoes (don’t worry it will be liquidy) for a few minutes until the tomatoes break down and start to caramelize with the onions. 5. Add spices and salt until they cover all the ingredients. Make sure to add a good bit of salt here. 6. Add the okra back into the saute and let mix with the spices for a few minutes. Last but not least, Coconut Rice! Following the instructions on the rice bag, boil 1 part rice with 2 parts liquid – only substitute a little over half the liquid with coconut milk. Add a pinch of salt and reduce heat to simmering. Cover until rice is done. You may want to add in some coconut milk at the very end for extra flavor. 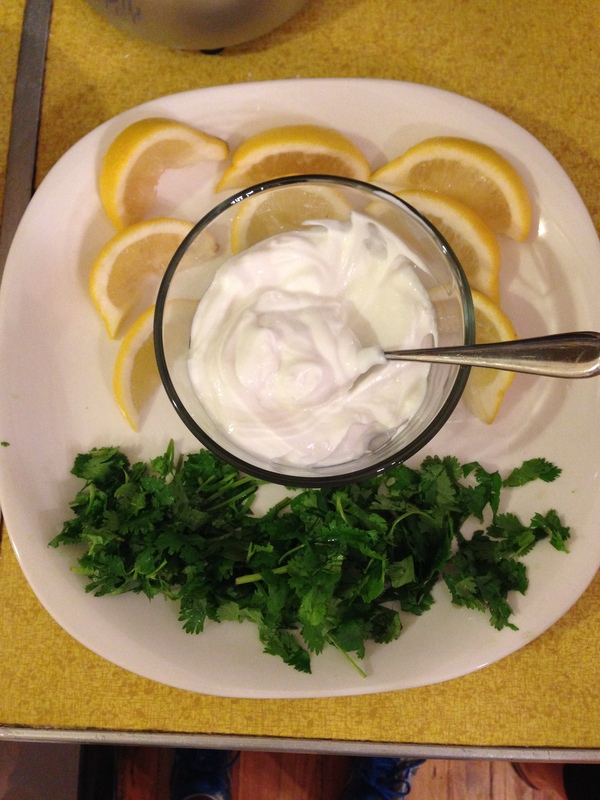 Serve everything together with lots of fresh cilantro, lemon slices, and yogurt to top! Have your favorite (and only) sister over to enjoy with you!